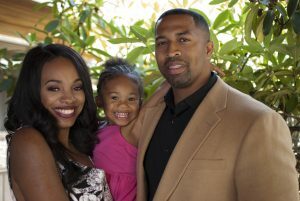 During Kela Hall’s first pregnancy, she and her husband, David, were thrilled to learn they would be having a girl. While most expectant parents are preoccupied with baby gear and registries, the Halls were struck by the challenges still faced by girls and women in the workforce. They decided to do something about it. college students, with a focus on women and girls. One such participant is BC student Seddrick Sampson. He came to Seattle from a small town in Georgia, where job opportunities were limited and most of the people he grew up with didn’t go to college. Sampson wanted to pursue his education and explore the fields of business management and marketing. He quickly found that Seattle’s housing market was more challenging than he expected, especially on a minimum-wage salary, and realized he needed to tap into community resources for support. Through the YMCA he was able to find a place to live and also land an internship in marketing. That experience led him to another marketing internship for the KD Hall Foundation, where he began to reflect on how his own work experiences compared with his sister’s back in Georgia. “I remember we were both working at a facility, and even though we had the same job and she had started before me, I was paid more. It didn’t seem right.” He’s learned this is a discrepancy faced by many women entering the workforce and has resolved to do what he can to change that. Because of Kela’s professional marketing experience, the KD Hall interns, many of whom are also BC students, focus on areas of marketing, public relations, graphic design, multimedia, social media and videography. Last summer they worked on a 30-minute documentary, Discovering You, which features women leaders across the state of Washington. It includes interviews with Washington State Supreme Court Justice Mary Yu, Seattle Interim Chief Carmen Best and actress Abby Dylan. The film premiered in September at the 2nd Annual Women on the Rise Leadership Conference held at the Museum of Flight.